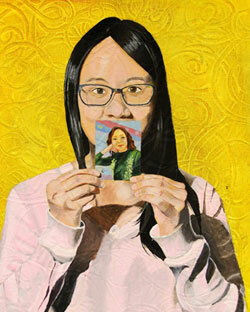 San-Yung Hung, “Mom and I”, 2013. Miss Hall’s School. Acrylic. 12″ x 16″. ©San-Yung Hung. All rights reserved. This year the High School Art Show showcases over 100 works of art from 14 different schools in Berkshire County. Students submit original works to the Berkshire County High School Art Show in a variety of media, including painting, drawing, photography, and sculpture. The young artists learn how to prepare their work for a gallery show, acquire a personal understanding of the exhibition process, and have the opportunity to exhibit their work in a professional museum setting. Participating schools in the 27th Annual Berkshire County High School Art Show include: BArT Charter School, Berkshire School, Drury High School, Great Barrington Waldorf High School, John Dewey Academy, Lee High School, Miss Hall’s School, Monument Mountain Regional High School, Mount Everett Regional High School, Mount Greylock Regional High School, Pittsfield High School, St. Joseph Central High School, Taconic High School, and Wahconah Regional High School. Admission to the High School Art Show is free. The exhibition is generously sponsored by Berkshire Bank.